Valves are linear with broad, rounded ends. The smallest valves are nearly circular. The sternum is broad and a single row of simple marginal pores is present. The pores are rimmed channels. In girdle view, frustules are rectangular. Frustules are joined together, forming filamentous chains. The valve face surfaces within a filament are alternately convex and concave and fit together convex surface to concave surface. Convex valves have pores that extend through the valve wall in a pervalvar direction. Concave valve pores extend in a transapical direction. 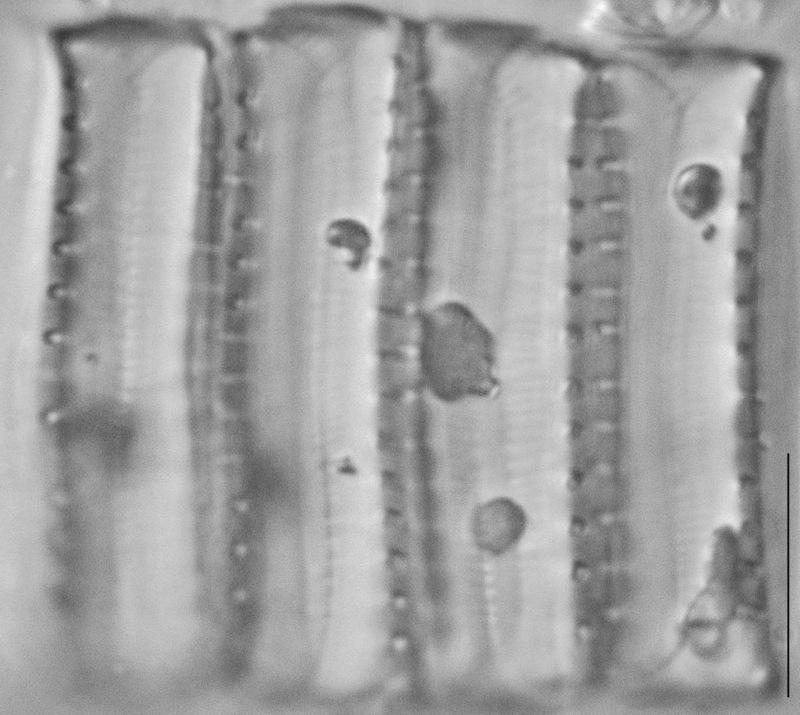 The channels formed by these pores in the thick cell walls are notable in light microscopy and their orientation varies depending on a concave or convex valve surface. In girdle view, the mantle is extended at the apices to form prows. 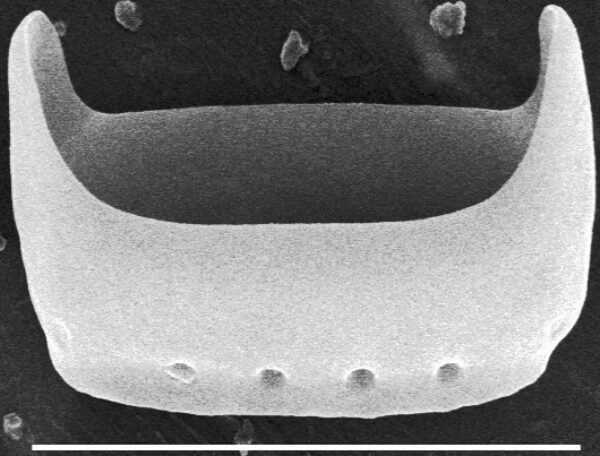 Within a frustule, the prows of the epivalve overlap the prows of the hypovalve (SEM). Cingula are incomplete and consist of segments that extend on one side of each valve between the prows. Only the epicingulum is visible in intact frustules. In prepared slides, many epicingula are lost. Post-auxospore valves are expanded centrally. Some valves have thick walls and broadened outlines; these valves are presumed to be resting cells. 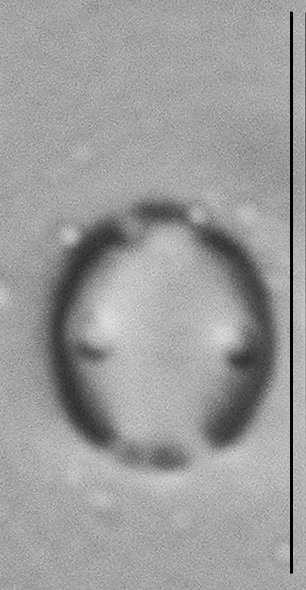 Diprora haenaensis has two parietal plastids in each cell. Living cells are joined colonies of 15-20 cells. 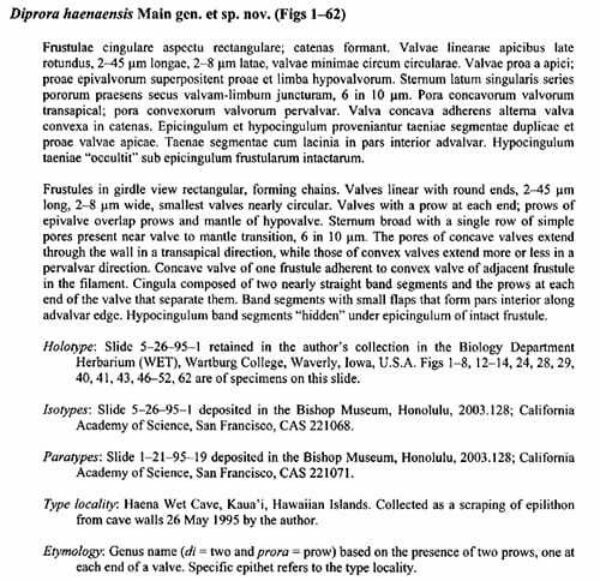 This taxon was described from a lava tube in Hawai’i, Haena Wet Cave on the North shore of Kaua’i beside the road to Kee Beach. Additional reports have been made from wet walls of other nearshore caves (Rex Lowe, personal communication). 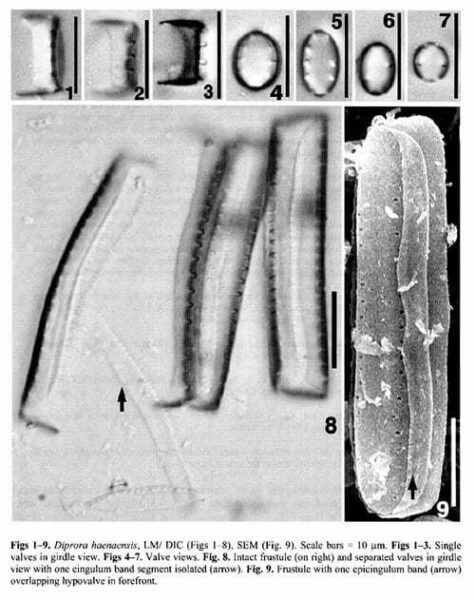 Filaments of D. haenaensis were found growing within a dense cyanobacterial matrix of Gloeocapsa, Chroococcus, and Oscillatoria (Main 2003). 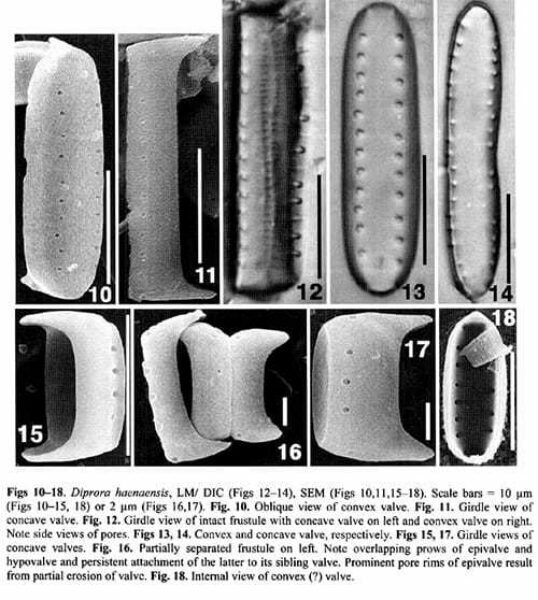 Within a sample, D. haenaensis dominated the diatom assemblage, contribution 80% of the total number of valves. Other diatoms present included Caloneis leptosoma (Grunow) Krammer, Denticula elegans Kütz., Diadesmis contenta (Grunow ex Van Heurck) D.G.Mann, Gomphonema truncatum Ehren., Nitzschia hantzschiana Rabenhorst, Navicula dfficillimoides Hust., Rhopalodia gibba (Ehren.) 0.Müller and Rhopalodia gibberula var. vanheurckii 0.Müller. Frustules in girdle view rectangular, forming chains. Valves linear with round ends, 2-45 µm long, 2-8 µm wide, smallest valves nearly circular. Valves with a prow at each end; prows of epivalve overlap prows and mantle of hypovalve. 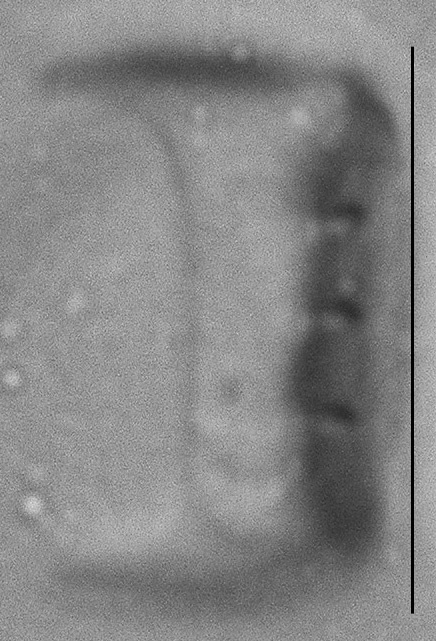 Sternum broad with a single row of simple pores present near valve to mantle transition, 6 in 10 µm. The pores of concave valves extend through the wall in a transapical direction, while those of convex valves extend more or less in a pervalvar direction. Concave valve of one frustule adherent to a convex valve of adjacent frustule in the filament. Cingula composed of two nearly straight band segments and the prows at each end of the valve that separate them. 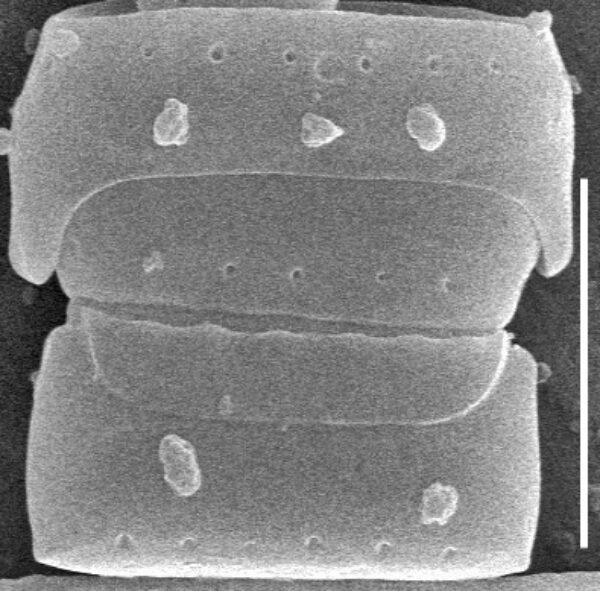 Band segments with small flaps that form pars interior along advalvar edge. Hypocingulum band elements "hidden" under epicingulum of intact frustule. Main, S.P. (2003) Diprora haenaensis gen. et sp. 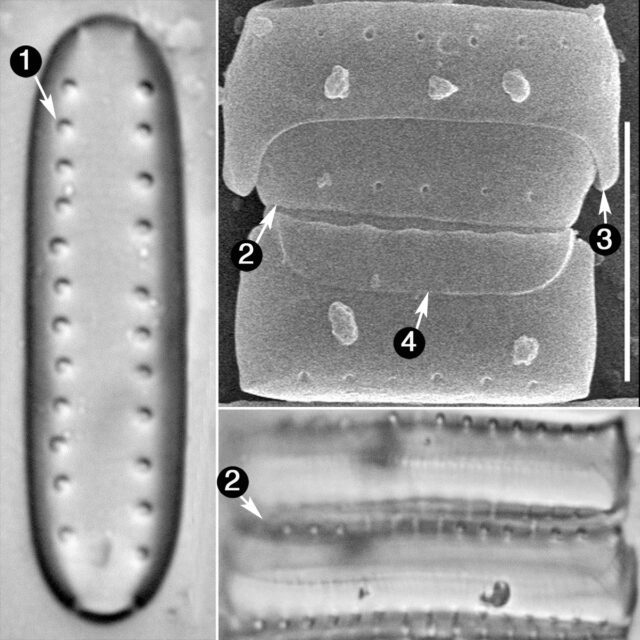 nov., a filamentous, pseudoaerial, araphid diatom from Kaua'i (Hawaiian Islands). Diatom Research 18: 259-272. Valves are linear with broad, rounded ends. The smallest valves within the size series are nearly circular. A single row of pores is present along the valve margin. Frustules are joined into filaments. The valve mantle is extended to form apical prows, a feature visible in girdle view.